Last edited by robertmo on 2018-3-09 @ 02:00, edited 1 time in total. 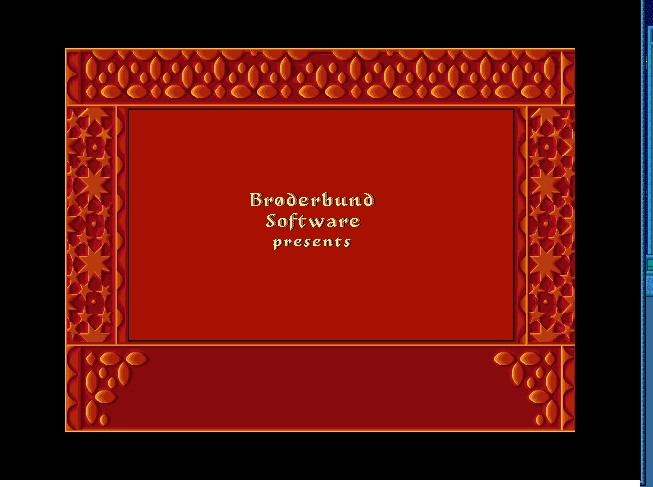 Prince of Persia 2 cutscenes are being displayed properly when used with slightly modified horizontal rezolutions. I enclose a build I made that works properly. Last edited by robertmo on 2018-2-27 @ 08:56, edited 1 time in total. Just download some already ready package and just modify it to your needs. HFVExplorer for managing hdd so you can add some games there. When did Mini vMac start supporting colour, and is there any reason to use it over Basilisk II? Today's Development source snapshot adds color to the Mac II emulation. So far this only works in OS X, with other platforms to be implemented later. The FPU and ASC are still not implemented, which sharply limits what programs will work without crashing (which I may not have made clear enough before). Two programs that will work nicely, in color, are "Slime Invaders 2.0.7" by Ingemar Ragnemalm and "Glider 4.10" by John Calhoun, which are both listed in the Arcade Games page. Besides adding color, this snapshot also patches out the RAM checking at start up code from the Macintosh II ROM (as is already done for other models), and initializes the PRAM more suitably for a Macintosh II. Together, these allow the Macintosh II emulation to start up much faster. Music also plays weird with Sheepshaver. Nevertheless I wonder If anyone could check how demo version behaves on real hardware in both 512x and 640x resolutions. I might be able to test on real hardware, if you tell me what you want me to do. I have a G3 and a couple of G4s. I also have a 6100 (one of the very first Power Macs) that's waiting on some repair parts and some way to transfer files to it. Should be going again soon. Sadly none of my 68k Macs have working PSUs. I'm also not sure if I have a working monitor that goes down to 512x384, but I can certainly do 640x480. The problem with 384 is that at 60hz it's only about 24Khz. If the game will handle a higher refresh rate it should be doable. Of course if my old 12" Apple monitor hadn't succumbed to the vertical foldover issue this wouldn't be a problem. Alright. Should be able to do that this evening. Oh well, I'd already taken screenshots before I read your last post, so might as well post them. Powerbook G4 1Ghz OS 9.2.2 640x480x120hz. Couldn't try 512x384 as 60hz is out of range of my monitor at that resolution, and I couldn't coax the Mac into giving me a higher refresh rate for that res. The crap off to the right and bottom is there because this was a dual screen set up. The right is the other monitor, the bottom is void. I cropped conservatively so as not to potentially cut of any off what the game rendered. Does it still work on Intel? And why does it run in a window and why does it have black bars in a window? Well much like we had Universal binaries which were OS X applications containing both PPC and x86 code, on classic Mac OS we had Fat binaries which were the same thing except 68k and PPC (usually marketed as "accelerated for Power Macintosh", white text in a red starburst oval) . 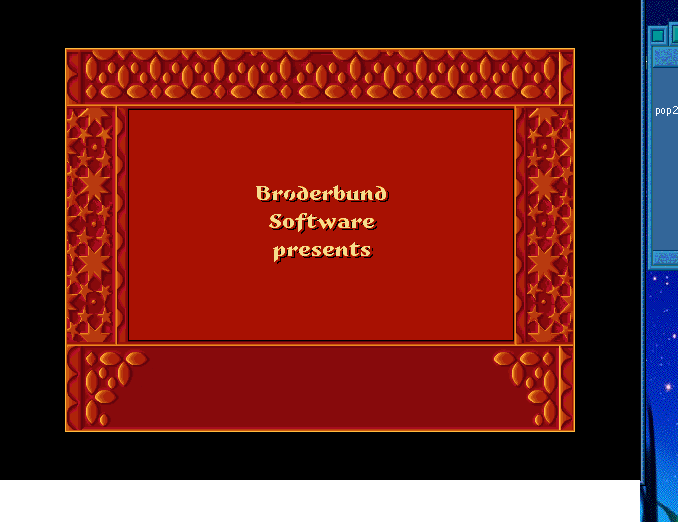 Prince of Persia though is old enough that it probably never got a PPC update (I didn't check). In that case 68k code was subject to binary translation to PPC code, much like Rosetta on Intel Macs. Except it was so fast and compatible that Apple never bothered to fully port Mac OS to PPC. It's not that the emulator itself was magically efficient compared with Rosetta (indeed there were third party alternatives that had better performance), but there was a huge jump in speed going from the fastest '040 at 40Mhz to the slowest 601 at 60Mhz. Also all 601s had an FPU, while many '040s didn't. That's not to say there were never performance or compatibility problems running 68k applications on PPC, but they were rare and mostly affected very old stuff, which often had problems even on an '040 or on System 7. It shouldn't affect a game as late into the 68k era as PoP2, seeing as that's from '93, the first Power Macs were from '94, and most of the really crap hacks from the '80s had been punished hard by that time. No. Doesn't run on Leopard either, even on PPC. In earlier versions of OS X it would probably run in Classic, but only on PPC. Last edited by Dystopia on 2018-2-27 @ 14:28, edited 1 time in total. robertmo wrote: And why does it run in a window and why does it have black bars in a window? That's running fullscreen, it's just 1:1 pixel mapping. It was tiny on the Powerbook's built in display at native resolution. I had some issues with 68k games running on PPC but they were very few. Alone in the Dark - Stuck on the very first stairs (this is not related to PPC code, but the game being run too fast, G3Throttle is able to fix this). DarkSeed CD Version - Crashes shortly upon launching (it has an unofficial PPC fix). Shows weird pallete on Mac OS 9.2.2 but not on 9.2.1 or earlier. Indiana Jones & The Last Crusade - Random crashes (it has an unofficial PPC update, which also made music play on PPC machines and made it 256 colours compatible). MS Flight Simulator 4.0 - Not related to PPC but random crashes on Mac OS 9.2.2 (runs fine on 8.6). Other than those, mostly no music/sound due to incompatibilities with the PPC sound chip.